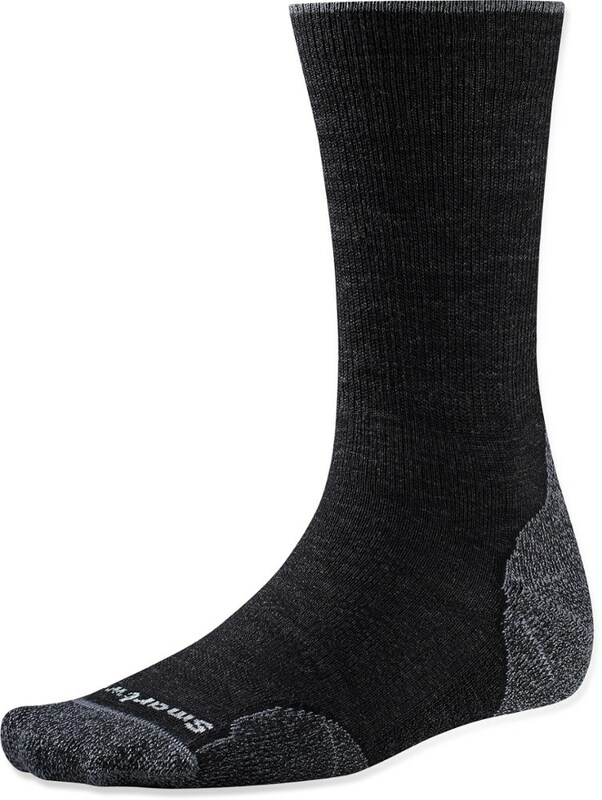 Lightweight, breathable with a cushioned sole and open mesh top, these socks work well on their own or as a liner sock. Roughly a crew height with a comfortable bit of compression support along with their ability to dry quickly make these especially useful in hot weather. 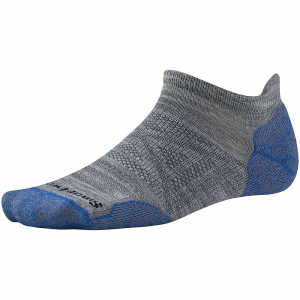 The Smartwool Outdoor Sport is a very versatile sock that functions well on its own in lightweight sport shoe applications, but also does a great job as a liner sock when wearing heavier boots. 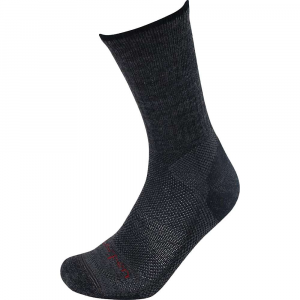 Made from an extremely flexible weave these socks wrap snugly to every contour of the foot and lower leg. 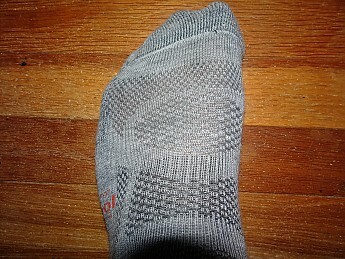 The cushioned sole comes as a bit of a surprise given how light the rest of the sock is. 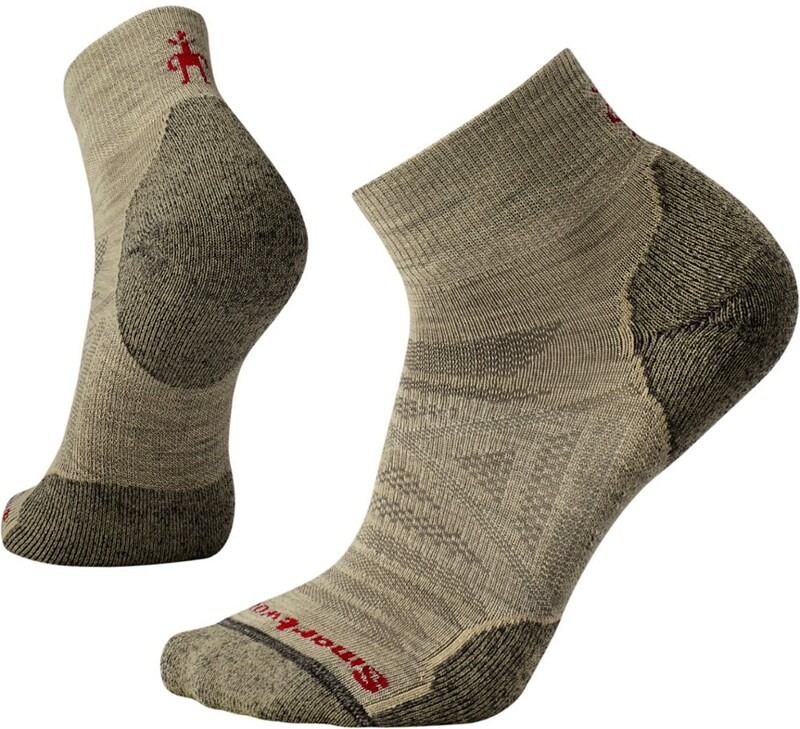 These socks stay up on the calf with no need to pull them up while hiking without being too tight on the legs. 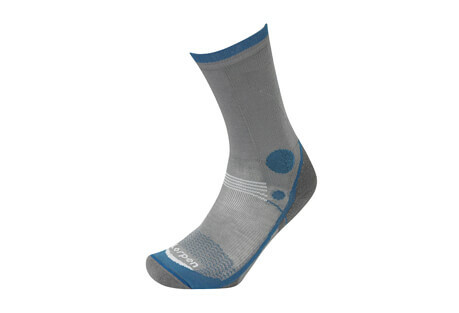 For something as simple as a sock the Smartwool Outdoor Sport certainly has a lot of complexity in its construction. Starting at the top there is a wide, double layered section designed to hold the sock up on the calf that does a very good job. From there to the ankle there is an area that provides a comfortable amount of compression without feeling restrictive at all. The foot has both heel and toe caps providing extra strength in those high stress areas. Those caps combined with the thick sole in between provide for a cushioned platform from heel to toe. Finally the top of the foot has areas of open weave material which allow the foot to breathe. These panels are open in the darker areas with just a few fibers and really help keep the foot cool in trail runners. I've used these socks alone and as a liner in combination with an outer sock for the last four years. They have been used in all four seasons and while I have purchased more over the years the original pair are still in use, though showing signs of wear. I really like these socks! They work very well when paired with a thick, hiking weight sock inside a full leather boot. 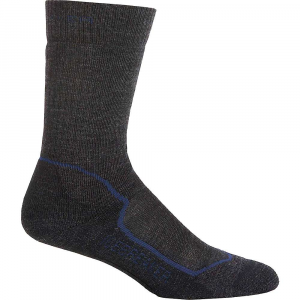 Their wicking ability helps pull moisture away from the foot and send it to the outer sock. 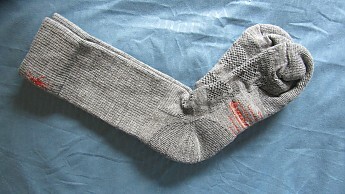 As a liner they protect against friction issues by letting the socks take the friction rather than the foot. They also dry very quickly which is nice on longer trips where hanging them on a line each night freshens them considerably. They also are nice alone in trail runners, being very light and cool on their own. The calf length might cause fashion issues with shorts for some folks, but as far as function goes they are worth the funny looks because of how they keep the feet cool and dry. I've also been pretty happy with how these socks hold up over time. The sock on the left is relatively new with a bit over 100 miles on it while the one on the right is several years old with quite a bit more time on trail. For me the heel is the only area that eventually wears out though there is some thinning at the ball of the foot as well. Based on my experience I'm comfortable recommending these socks to anyone looking for a wool liner for four season use. I'm also pretty sure most would find them to work well with trail runners if used alone as my experience there has been good as well. Nice Reny's find, LoneStranger! Thanks for the review. 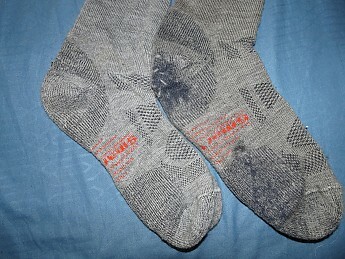 These socks are very durable and comfortable. I own about 5 pairs of the exact sock and have had no problems with them. They dry very quickly and there is no smell when you wear them for days. I love these socks. Have never had any problems or of them. The only problem is they are not cheap. You will pay right at $15 a pair for them. But well worth the price. It's a lot cheaper than having to buy packs of socks because they wear out. 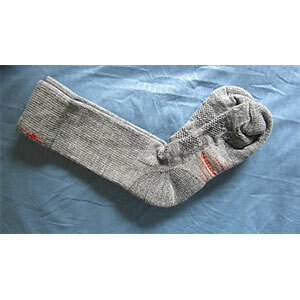 You can wear these socks for days before there is any smell, and if you don't sweat then there is no smell. Buy these socks and have happy feet. Welcome to Trailspace, Larry. Thanks for the review. 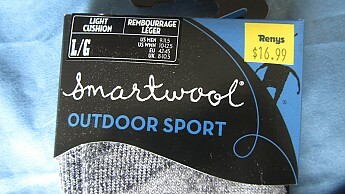 The Smartwool Outdoor Sport Light Cushion is not available from the stores we monitor.